Those interested in a manual transmission can get a 2.5i base model for a real deal at just over $23,000. If you want higher-end options, you have to forgo the manual, and spend considerably more money. The Subaru Forester is a compact utility vehicle with wagon-like practicality and standard all-wheel drive. It has the capabilities of a crossover, the ride and handling of a car, and plenty of all-weather security and even off-road capability. It’s the Japanese brand’s best-selling vehicle line, not to mention the winner of our Best Car To Buy 2014 award. We view the Subaru Forester as one of the best all-round cars in its segment, and we confirmed that judgment when we spent a few months with a turbocharged Forester 2.0XT across a variety of terrains and driving cycles. The Forester’s simple, handsome shape manages to be modern without excess flash. It offers superb outward visibility in an era in which too many automakers use roof-crush standards as an excuse for abysmal rearward visibility. Minor detail tweaks for 2017 update the look, though there are sill a few too many different vents, lights, grilles, and accents on the turbocharged 2.0XT model. In general, though, we like Subaru’s latest, somewhat restrained design language. Inside, the controls are simple, logical, and easy to use; it’s a vehicle you can drive for the first time without having to study an owner’s manual. Interior materials include a mix of matte and soft-touch surfaces accented with matte-finish metallic trim, and they have been improved in recent years. Laudably, Subaru has improved the noise suppression in a few steps. More sound insulation was added for this generation and this year it gets more sound deadening, thicker door glass, restructured door seals, and an acoustic windshield. Taller drivers may find the front row's lower seat cushions a little short, but rear passengers have plenty of leg room and the rear seat back folds close to fully flat with a simple one-touch mechanism. Cargo space is generous for the class. Behind the wheel, the Forester falls on the sportier end of the handling scale—far sportier than the Honda CR-V, Nissan Rogue, or Toyota RAV4. 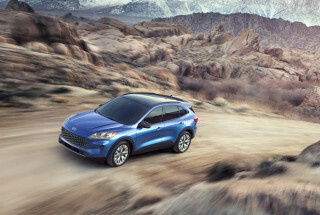 And its combination of standard all-wheel drive and almost 9 inches of ground clearance makes bad weather or off-road excursions feel just as secure as conventional travel on pavement. 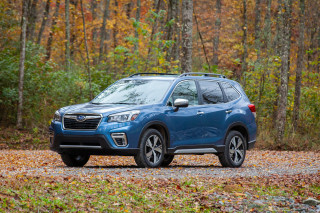 The steering is nicely weighted, the body doesn’t roll much for a tall utility vehicle, and Subaru’s CVT is the least annoying one we know of. 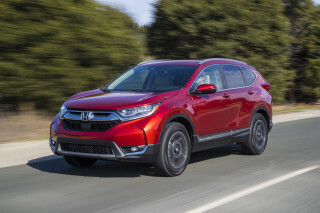 Its gas mileage—as high as 28 mpg combined, up one mpg this year—is at the top of the class as well, though a new crop of smaller and less roomy SUVs now beat that. The Forester has earned high praise from the IIHS, including a Top Safety Pick+ designation thanks to it's consistent "Good" ratings on all crash tests—including the difficult small overlap frontal crash—and optional safety equipment. The federal government has been equally kind, giving it a five-star overall rating, though it earned four stars for frontal impact protection and rollover. Available active-safety features are highlighted by Subaru’s excellent EyeSight camera system, which spots road hazards ahead and brakes to avoid an accident or reduce its impact. This system gets color cameras this year and they provide a longer, wider field of vision. Also newly available are automatic high-beam assist, steering-linked headlights that point into turns, and reverse automatic braking. The 2017 Subaru Forester is offered 2.5i and 2.0XT models, with base, Premium, Limited, and Touring trim levels for the 2.5i, and only Limited and Touring trims for the 2.0XT. Prices range from just over $23,000 to close to $35,000. Even the base model comes with Bluetooth hands-free calling, audio streaming, a rearview camera, and a 6.2-inch touchscreen for basic infotainment functions. Notable features that are available as options or standard on higher line models include a version of the infotainment system with a 7.0-inch screen; perforated leather seats; a power rear liftgate; an eight-speaker, 440-watt stereo. The base 2017 Forester 2.5i with the 2.5-liter engine and CVT boasts EPA ratings of 26 mpg city, 32 highway, 28 combined, and those numbers fall to 25 mpg combined if you specify the 6-speed manual. 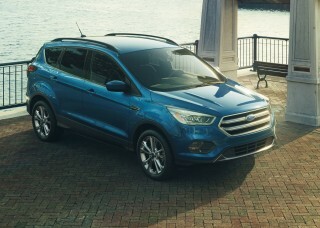 The 2.0XT is also rated at 25 mpg combined. The Subaru Forester's design is clean and straightforward, though perhaps a bit generic, even with some 2017 updates. The Forester's shape is clearly that of a tall wagon with SUV ride height, and Subaru has thankfully ignored the fashion for swoopy designs and racy-looking utility vehicles. Instead, the 2017 Forester is a handsome vehicle that keeps easy access and outward visibility as its priorities. The hood has character lines in the center and along the sides, but the chiseled front end is slightly let down by a profusion of details down low, including an aggressive air dam on turbo models that brackets the front end like dewlaps. There are some detail changes for 2017. The grille gets new mesh, the front bumper on 2.5i models is slightly revised, and the headlights and taillights incorporate C-shape motifs. Moving inside the Forester, the instrument panel shares its relatively simple layout with the larger Legacy mid-size sedan and Outback crossover utility. It's further forward, and lower, giving more openness to the front-seat areas. Multi-information screens top a center console that contains simple, intuitive climate and audio controls and sweeps into a center console with an armrest, the inevitable cupholders, and a variety of storage bins. The 2017 Subaru Forester offers enjoyable on-road dynamics, decent off-road capability, and, if you choose the turbocharged XT model, spirited performance. The 2017 Subaru Forester comes down slightly on the sportier end of the performance scale, with better acceleration and more reassuring handling than a Honda CR-V or a Nissan Rogue. It doesn't have the agility of the Ford Escape, or the driving pleasure of the Mazda CX-5, but it blends a pleasing amount of fun into its eminently capable all-weather-wagon recipe. The standard powerplant in 2.5i models is a 2.5-liter, flat-4 making 170 horsepower, paired with a continuously variable transmission (CVT) or a 6-speed manual. All-wheel drive is standard on every Forester (and is on every Subaru except the BRZ sports coupe). The 2.5i Foresters aren’t all that quick, but they’re adequately powerful for a vehicle weighing in at about 3,300 pounds. Move up to the Forester 2.0XT, however, and the picture changes. That turbocharged, direct-injected 2.0-liter engine, also a flat-4, puts out a stout 250 hp and 258 lb-ft of torque (on premium gas). It comes only with the CVT, though. The curb weight on top trims rises to about 3,600 pounds. If you’re going for the standard 2.5i model, the CVT will be just fine for most people, though we remain fond of the 6-speed manual, an increasingly rare offering in compact crossover utilities these days. Its shift linkage may be a little sloppy, and its throws are long and truck-like, but it’s the way to get the most power out of the boxer engine. Plus, the mechanical-split all-wheel-drive system makes the Forester a little more fun, as well as a little more predictable, whenever traction gets scarce. 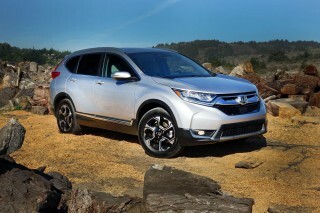 If you want to go with the greater performance of the XT, the CVT is livable and unobtrusive, and its simulated 8-speed mode really redeems it. The Forester's capable roadholding is best shown off by the more powerful turbo engine. The ride is comfortable, and not very abrupt over large bumps. 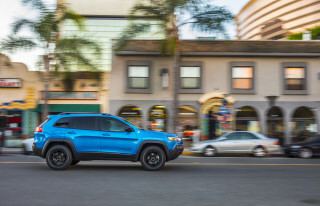 The XT has especially good body control, as well as well-tuned and nicely weighted rack-mounted electric power steering that gets a quicker ratio this year. Considering the toughness of the little SUV, and its cargo capacity for weekend outdoor gear, that's a win. For 2017, the 2.0XT Touring also adds brake-based torque vectoring that brakes the inside rear wheel in a turn to help the vehicle rotate. We might still prefer a Mazda CX-5 if we were using it entirely on pavement, but for any off-road or trail use, the Subaru gets the nod. Back on the pure performance side, Subaru's SI-Drive system offers three modes—Intelligent, Sport, and Sport Sharp—that tweak the way its accelerator and powertrain respond to driver inputs. 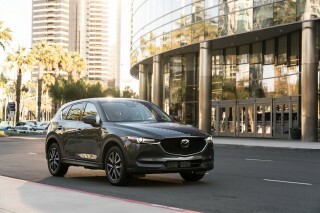 Sport Sharp transforms the 2.0XT's CVT—it simulates an 8-speed automatic, with snappy shifts and manual control via steering-wheel shift paddles (not offered on 2.5i models). In Intelligent or Sport, there are six simulated gears available via the paddles instead of eight. The Forester's somewhat rugged trail prowess includes 8.7 inches of ground clearance and approach and departure angles that even off-road purists won't quickly dismiss. 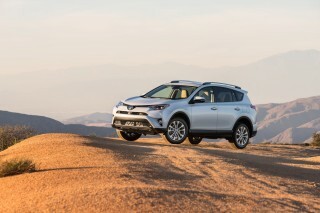 For additional security in off-road conditions, Subaru offers an "X-Mode" that distributes power left to right at low speeds, supplementing the all-wheel-drive system’s standard front-to-back distribution. That function helps Subaru’s utility wagon play on some of the same hills as competitors from off-road stalwarts Jeep and Land Rover. The Forester can tow up to 1,500 pounds with either engine. The interior environment may not be luxurious, but the 2017 Subaru Forester's cabin offers excellent space for both passengers and cargo. One of the main complaints about the Forester, along with many Subarus, has been interior noise. For 2017, Subaru addresses that issue by adding even more soundproofing, thicker door glass, restructured door seals, underfloor insulation, and an acoustic windshield. We haven't driven it yet, but these measures will certainly reduce wind, engine, and road noise, though we can't say how it will compare to the competition. Interior materials include a mix of matte and soft-touch surfaces accented with matte-finish metallic trim. These materials have been improved in recent years, from upholsteries to door trims, and this year Subaru adds an available Saddle Brown perforated-leather upholstery with contrast stitching for Touring trim levels. It also includes matching brown leather trim for the door panels, center console lid, and other bits. 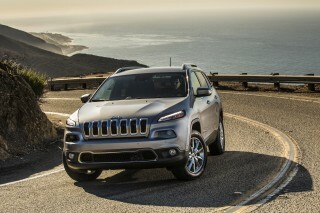 This choice will certainly provide an upscale look for a car that is decidedly mainstream. Though it is a compact crossover, the 2017 Subaru Forester offers plenty of interior space and it feels roomy as well. Our one complaint is that the front seats lack enough bolstering on their short, flat bottom cushions, and bigger drivers will find that they continually touch the Forester's center console and door panels—both of which lack some soft surfaces. The front-seat issue is more acute in turbocharged models, as no sport-seat option is offered. The commanding view and outward visibility is worth those minor trade-offs, in our view. The rear seats are easy to get into, with good leg room, almost 40 inches of rear seat head room (without the sunroof), and a low driveshaft tunnel for the segment. The rear seats' subtle contouring should make them comfortable for longer trips. All but the base model get three-position recline for the (60/40-split) rear seatbacks, an unusual and welcome feature, and all models have a fold-down center armrest in the rear, too, including solid-looking cupholders. The rear seatback almost folds flat with one button. Cargo space is quite competitive. The Forester has 34.4 cubic feet of cargo space behind the rear seats, and 74.7 cubic feet when the second-row seats are folded down. Excellent outward visibility and top safety scores make the 2017 Subaru Forester one of the safest vehicles in its segment. 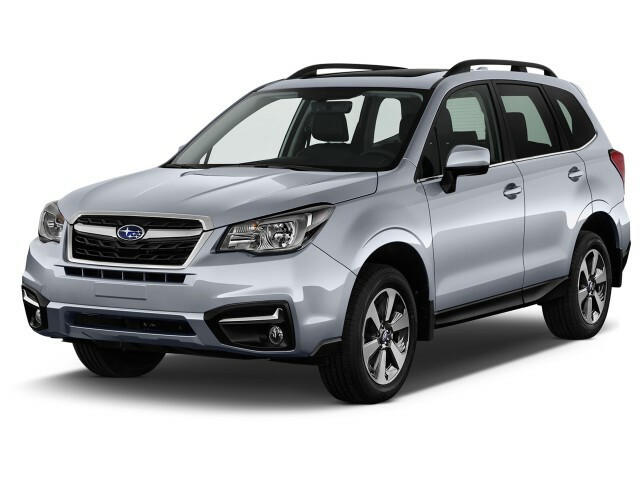 The Subaru Forester has a history as one of the safest vehicles in its class and it adds even more safety features this year while improving others. In addition to the usual and government-mandated safety features, the 2017 Forester comes standard with a rearview camera, a driver's knee airbag, and active front head restraints. For 2017, all Limited and Touring models add blind-spot monitors and rear cross-traffic alerts. Those features are also added to Premium models ordered with Subaru's EyeSight system. Eyesight is optional, along with adaptive cruise control that runs at speeds of 25 mph up to 90 mph. EyeSight spots road hazards ahead thanks to a pair of cameras. This year those cameras are color and they provide a longer, wider field of vision. Last year they could read up to 80 meters ahead, but there is no quoted distance this year. EyeSight can potentially avoid an accident, or reduce its severity, by automatically braking at up to 0.4g. Limited and Touring models equipped with EyeSight also add automatic high-beam assist, steering-linked headlights that point into turns, and reverse automatic braking. Also standard on Premium models and above is the Forester's off-road "X-Mode" that uses hill-descent control to keep speeds slow and safe while heading down steep, slippery slopes. The 2017 Forester received an overall five-star rating from the NHTSA, with four-star ratings for front-impact and rollover protection. The IIHS awarded the 2017 Forester its coveted Top Safety Pick+ designation, thanks to its highest score of "Good" in every single test category, coupled with a "Superior" rating for the available forward-collision protection system. The 2017 Subaru Forester fulfills its mission most honestly in its base models, but it does offer some premium options like leather and a moonroof. The 2017 Subaru Forester is offered in 2.5i and 2.0XT models. In addition to the base model, the 2.5i comes in Premium, Limited, and Touring trim levels. The 2.0XT is offered only in Premium and Touring trims. Prices range from just over $23,000 (including destination) to close to $35,000 for the top-of-the-line Forester 2.0XT Touring model. The base 2.5i model comes standard with a tilting and telescoping steering wheel, Bluetooth hands-free phone connectivity, steering-wheel controls for the audio system, and a 6.2-inch Starlink multimedia display for the rearview camera and various trip computer and temperature functions. The 2.5i Premium adds 17-inch alloy wheels, a 10-way adjustable power driver's seat, reclining rear seatbacks, a panoramic power moonroof, and a 7.0-inch touchscreen infotainment system. Manual-transmission 2.5i Premium cars get the All-Weather Package, which includes heated front seats and side mirrors, plus a windshield-wiper deicer. This package is optional on models with the CVT. 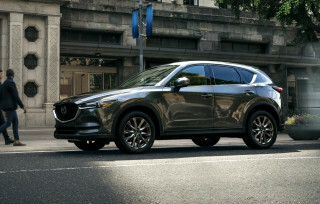 The 2.0XT Premium has 18-inch wheels, the All-Weather Package, larger brakes, a sport-tuned suspension, a leather-wrapped steering wheel and shift knob, a rear spoiler, and the X-Mode for the all-wheel-drive system. Only the Touring models, however, include a 440-watt premium audio system, keyless ignition, a heated steering wheel, an excellent one-touch folding rear seatback, dual-zone automatic climate control, and HID headlights with automatic height adjustment. The 2.0XT Touring also has torque vectoring. All Limited and Touring models add blind-spot monitors and rear cross-traffic alerts for 2017, and touring is newly available with an attractive brown leather interior. Improvements this year bring combined fuel economy for the most common powertrain to 28 mpg, which is quite respectable for the class. For 2017, Subaru made some tweaks to the 2.5-liter flat-4 and continuously variable transmission (CVT) powertrain in the high-volume 2.5i. As a result of the changes, EPA ratings improve from last year's 24 mpg city, 32 highway, 27 combined to 26/32/28 mpg this year. With the 6-speed manual transmission, which goes on sale later this year, those numbers fall to 22/29/25 mpg. The turbocharged 2.0XT model is rated at 23/27/25 mpg, though shoppers should note that premium fuel is recommended in those models. In a few thousand miles of mixed driving during our Forester XT six-month road test, we measured just over 24.1 mpg overall, which is well within the EPA's suggested variance of 10 to 20 percent from its combined ratings.